Successfully Added Digital TV Receiver (ATSC) for Computers - USB Tuner + Antenna to your Shopping Cart. Digital TV and analog TV USB tuner for computer users in the United States, Canada, Korea, Mexico, and certain Central and South American countries. Its 2009 and digital TV is here! Don't miss a single minute of your favorite sports and TV shows. With this USB Dongle (ATSC / NTSC) you have a modern digital television tuner for use with your desktop, laptop or netbook computer. Powered directly from a USB 2.0 connection, you'll be ready to receive and watch all your favorite shows in digital picture beauty and clarity. The dongle and antenna combination provides you a convenient, small form factor that won't get in the way on the home desktop or in the office. Used in combination with DVR software you can both watch and record your favorite TV programs with ease. Simply install the TV tuner and install an open-source or commercial software DVR solution and you will be in digital TV heaven! This computer ATSC receiver provides a cost-effective, high quality solution to delivering digital TV reception to your computer. Be ready for the digital revolution with this amazing product available direct to you at an awesome wholesale price from Chinavasion. 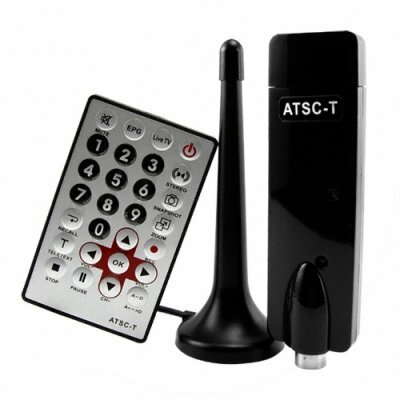 Note: This product will only work with ATSC Digital Television and NTSC Analog TV. Join the digital TV revolution with this great ATSC DTV USB adapter! Support for full ATSC functions (when using DVR software) - EPG, Scheduled Recording, Parental Control, Snapshots, etc.